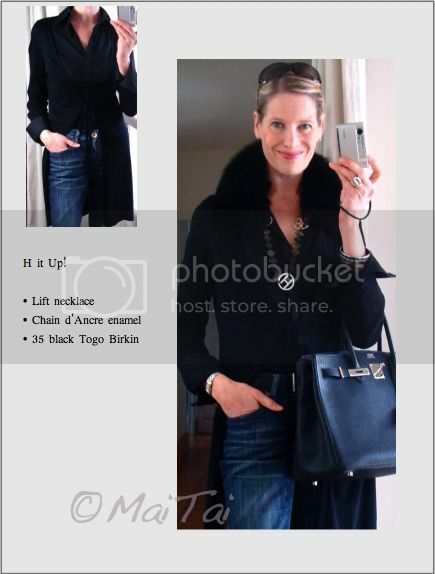 Black and blue is one of my favorite color combinations and today's casual look is jeans with an all black shirt, cardie and fox collar. Gorgeous! I received the black fur collar today in the mail. It is so pretty and exceeded my expectations! I spent quite a while playing with different scarves using the collar and so far I am in love with how it looks with the "coaching" scarf in the blue colorway. I think I'll wear that one first. Merci for leaving the feedback Bonjour Madame, I am so very happy to hear! Hope you'll continue to have fun ~ enjoy a chic and cosy winter! Yay to black DD! Thank you dear, wishing you a wonderful weekend too!